A reliable and efficient software utility designed to help you organize and value your stamp collection using SCOTT numbers identification. StampManage is an advanced and professional software utility that allows you to create detailed stamp collections on your computer. – 153,620+ hi-res images to help identify your stamps. 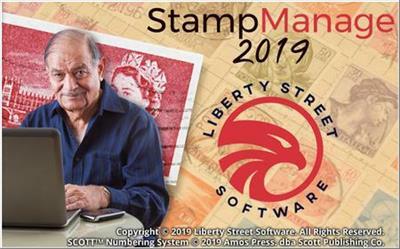 Liberty Street Software is Officially Licensed to use the SCOTT™ stamp numbering system. – Numerous useful reports, including a Stamp Checklist and a Stamp Album Page report that will let you print out Stamp Album pages complete with identifying images. – How Much is your Collection Worth? Find out with our up-to-date Market Values including Plate Block & Sheets. – Use our amazing eBay™ & BidStart™ search feature to quickly search current & completed auctions by SCOTT™ number…A great way to find recent selling prices.